Playbitpoker offers a satisfactory experience for avid online poker players. It packs several game features that make its betting platform pleasing and attractive, but it somewhat falls short in certain aspects, especially when compared with other Bitcoin-powered poker rooms. Nevertheless, this online poker betting site is still a decent venue to play poker with Bitcoin against other bettors in the world. Find out more about its features and services to get a complete overview of the kind of online betting it is capable of providing. Playbitpoker successfully makes a mark in the industry by incorporating the HTML5 technology into its platform. This is a great step for any online betting site because it enables bettors to continue their wagering sessions no matter where they go through the use of their mobile devices. With the poker game being mobile-friendly, it is guaranteed that more winnings will be received. Unfortunately, this poker room offers only one game, which is Texas Hold’em. Although this poker game is undeniably popular and a top favorite of most poker players, it would still be better to find other poker games in the lobby for variation. While other Bitcoin poker rooms require rakes totaling to 5% with some even amounting to 10%, this betting site only demands 1% rake. In this way, bettors can easily begin several rounds of playing poker, especially the bettors who have smaller bankroll. With this low rake for its Texas Hold’em game, Playbitpoker will certainly be an attractive venue for online Bitcoin poker enthusiasts, whether experienced or novice. Poker players will be welcomed by an average-looking betting interface and platform. While it is not exactly the best in its league, it is surely not the worst. 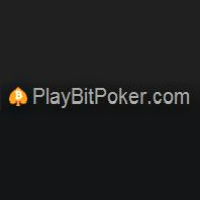 Thus, Playbitpoker is in the middle when it comes to this criterion. However, this still requires the poker room to improve its graphics and platform, especially because these two things are the key elements behind every player’s satisfaction with the gambling site’s performance and services. After all, a user-friendly interface may be a waste if the overall appeal seems old-fashioned. Having said this, this betting site still manages to provide fun in every round. While it may have lacked a few features in other facets, this Bitcoin online gambling site has done a commendable job with its customer support services. Players can freely contact the support team through chat and email, and they respond to queries and concerns within an acceptable time frame. Customer support is extremely important for every betting site and for all online poker players, that is why having a reliable and efficient support system is a plus.